In this episode of The Brain Food Show, we start out by discussing the fascinating story about how the statue of Shakespeare in Central Park, New York, got there, what John Wilkes Booth’s Brother did for Abraham Lincoln’s son, the real story about why Caesar dressing is called that, and a bunch of other interesting stuff! 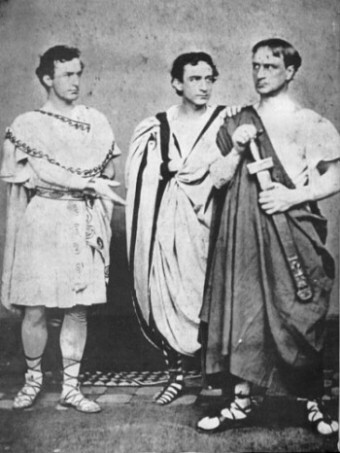 This is part 4 of our 4 part series on Julius Caesar. Stay tuned next time for when we talk about something completely different! I do enjoy these podcasts because it’s a conversation that feels natural. It’s the same with Karl’s channel, the conversation that occurs during the videos has a natural and relaxed feel to it. You guys (i.e. Simon, Karl, and Daven) have more natural and appealing vocal inflections in conversation format than just reading a script. this is the first podcast I have listened to. I had to download a podcast player just to listen to brainfood. great job and i am thouroughly enjoying the show. as a side note, i honestly think simons voice is the the most prevalent sound in my life with youtube and this. Brainfood is my 1st podcast. I love it! Thanks for helping me get lost and learn new things, also Mr. Simon your voice is magic!